Female clients of Sonata learn how to repay microloans via mobile phones instead of in person. Grameen Foundation India, in partnership with Oxigen Services India Pvt. Ltdand Sonata Finance Pvt. 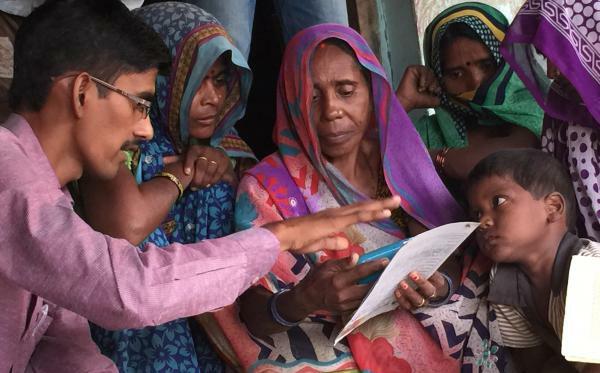 Ltd., is using a human-centered design approach to deliver mobile financial services and education to Sonata’s female microfinance clients in Uttar Pradesh. In our first blog post, we discussed barriers that inhibit the poor, particularly women, from adopting the mobile channel. Our research reinforced whatprevious Grameen Foundation studies have told us—low levels of mobile and financial literacy are massively hindering the reach of this channel among poor women. Most microfinance clients have basic feature phones, so mobile money providers typically use relatively simple USSD or SMS based applications to serve them. Even so, it is not easy for these clients to transact by themselves. Our interactions with other institutions piloting similar programs also indicate that if unassisted “self” transactions are introduced too early, only one or two women from each group (or their husbands), who are relatively more comfortable with mobile phones, end up transacting every week. Most women go to mobile money agents to transact on their behalf. If agents are not trained on handling such clients, they either decline support, or do not service these requests appropriately. Both are bad outcomes. Sonata’s female clients have developed a trusted relationship with the microfinance institution over many years, and are used to repaying loans as a group at a branch office. They now need to get used to the idea of making repayments in a completely different manner – individually, over their mobile phones, and through agents of a third-party mobile payments provider, Oxigen, rather than Sonata. While some of these agents are often local shopkeepers in the same communities, who the women possibly know and interact with, this is still a leap of faith for them. Habits are slow to change and trust is hard to gain. Recognizing this, we decided that any long-term behavior change is possible only one step at a time. Our goals are to (a) introduce a third party agent as a venue for payments; and (b) make sure that clients associate their mobile phones with these payments. We have therefore decided to first proceed withfully agent-assisted transactions. Agents transact on their point-of-sale (POS) machine or through web-enabled terminals, via the client’s Oxigen wallet. The clients are however cautioned to keep their Personal Identification Numbers (PIN) safe and to enter it themselves. Group Payments: Clients are used to making payments as a group at Sonata. Hence, we currently permit them to pay their loan installment as a group through their Oxigen wallet as well. Any group member can pay through her wallet, and the payment is accounted towards the group. Part payments and multiple payments by members are also permitted. Once clients become more comfortable with this new channel, we will transition them to individual payments through their own mobile wallets. Agent commission in lieu of transportation cost: Previously the women took turns in paying loan installments for the group at a branch office, which could be as far as 15 km away from their residence. Clients (or a designated family member) therefore use public transport and incur a cost. There are informal arrangements between group members to account for this cost – some groups split this cost between members every week, while in some other groups, members incur this cost by turn. Under our project, we permit the same arrangement to continue. However, instead of paying for public transport, the group pays the agent a commission for each transaction. Printed transaction confirmation: Clients are used to receiving a receipt from Sonata for each transaction. With the new channel, clients receive an automated transaction confirmation via SMS on their mobile phone. However, we have also ensured that they get a printed confirmation for each transaction from the Oxigen agent. Our belief is that sustainable behavior change will set in over time, with increased understanding and acceptance of the digital channel among Sonata’s clients and staff. We are therefore ensuring that all processes—registration, sign-up and transactions are kept as simple as possible. If processes are too difficult, or require significant changes from what these clients are used to, they may just end up not using the channel at all. Slow and steady truly does win the race! Stay tuned as we continue our journey with Sonata’s clients, and share more learnings along the way.